Elegant curved lines paired with rounded edges and wide armrests will create a truly comfy spot to sit in and relax after a day at work or doing a lot of home chores. At first, you might feel some chemical smell. A reclining armchair with a footstool from BetterLife will help you set up a functional lounge area in a large open living room or a den. 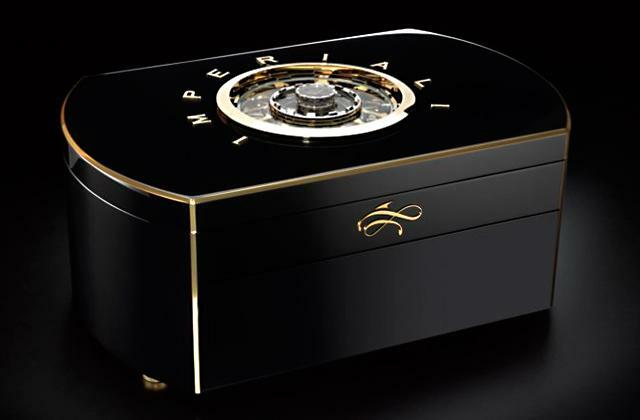 Designed in modern classics, it will add an exquisite touch to any contemporary interior. Sitting in comfort, you can always turn in any direction to know what's going on behind your back. The model is offered in three color designs. Thanks to an adjustable seat height regulated within the range from 44 to 57 cm, this model will ensure a comfy seat for users of any height. A backrest might seem somewhat low for taller sitters. The WOLTU can be used both as a high bar stool and as an ordinary table chair and will fit both for home and for commercial use. It will find its place not only in a kitchen, dining or living room, and a balcony but also in a pub, cafe, hair salon or barbershop. Its relatively light weight makes it portable while 8 color patterns give you a choice to match it with any interior. The headrest is made of soft yet resilient high-density 24D sponge. Perfectly keeping its shape, it will provide due support to your head and help release the muscle strain in your neck. 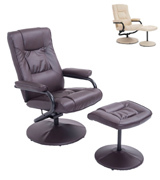 If you want to sit in comfort and relax watching TV or reading a book when at home or work in comfort when at the office, the HOMCOM swivel chair with a reclining back is a good choice to go with. A roomy seat will embrace you with comfort and a footstool will keep your feet in a maximum convenient position when sitting. The item is available in 2 basic colors. 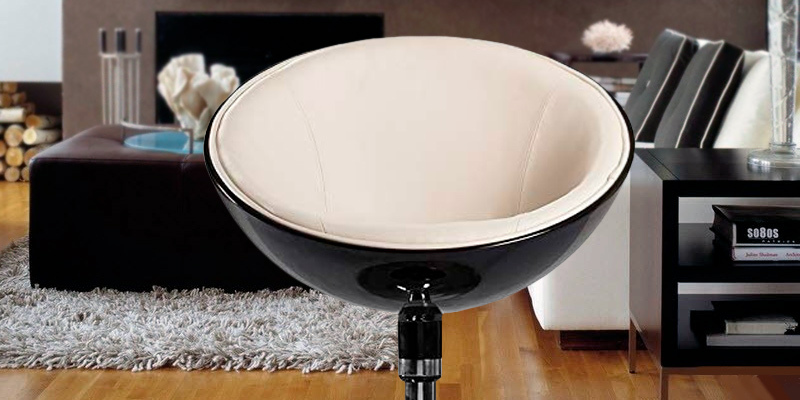 A semi-sphere exterior made of durable glossy plastic is a zest of this model that makes it not only a seat but also a piece of decor. The armrest area is pretty firm. The Duhome stool with a swivel mechanism stands out for a retro-style design distinguished by elegance and functionality. 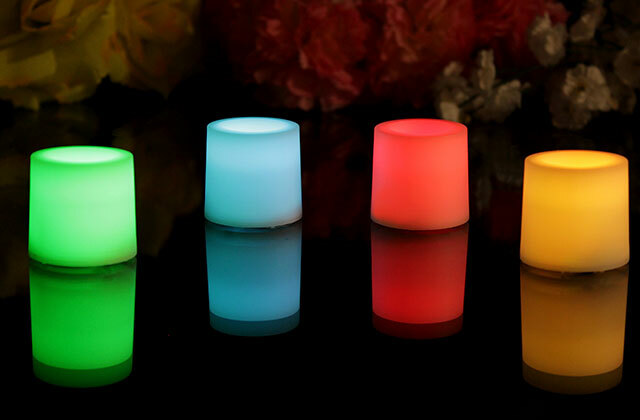 Offered in 4 bright and vivid colors combinations, it will liven up the interior of a modern flat, bar, small cafe, night club, or reception area in a beauty salon. 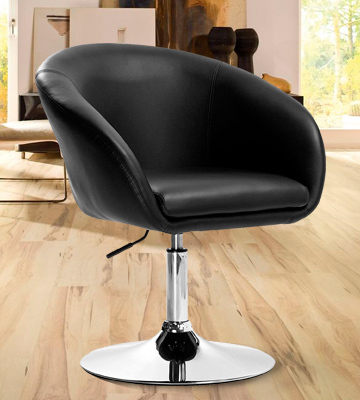 A faux leather seat is padded with a dense material to ensure comfort for long sitting. An ergonomically designed curved seat provides ample space and keeps you seated relaxed in a tilted position instead of a strictly upright posture. With that, the back is high enough to support your head. According to some users, the chair chassis might start creaking a bit over time. If you look for a contemporary swivel armchair that will offer you both style and comfort, the Constantino Montana will get you covered. 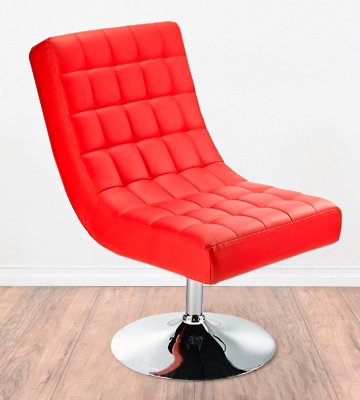 Its modern design in bright red will become the focal point of any interior, while its generously sized soft seat will provide so needed comfort. The best part is, it comes at a very affordable price. When planning our living space, we strive to make the best of it, especially when it comes to the rooms where we spend most of the time, like a living room or family rest and entertainment area. And the armchair is part and parcel of home comfort. 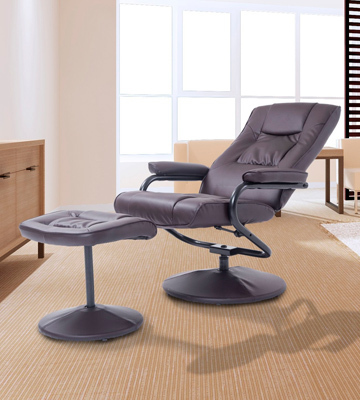 The BetterLife swivel recliner fully lives up to its name and will bring your home comfort to a new level. 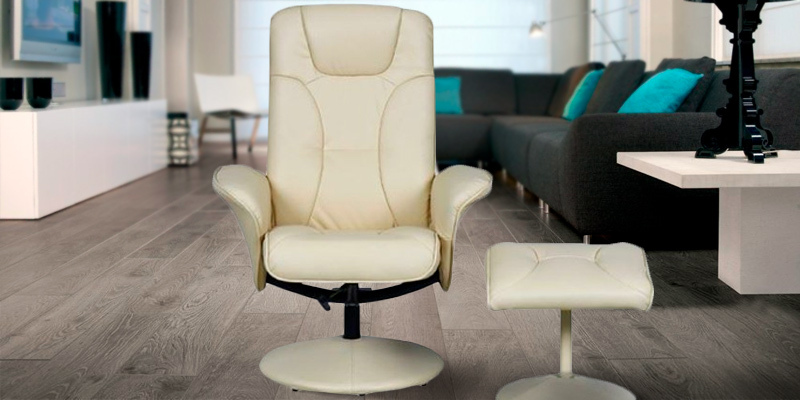 The seat is wide and spacious, a high reclinable backrest with a soft headrest will ensure anatomical body position, no matter how tall you are, and a complementary footstool will support your feet when sitting. 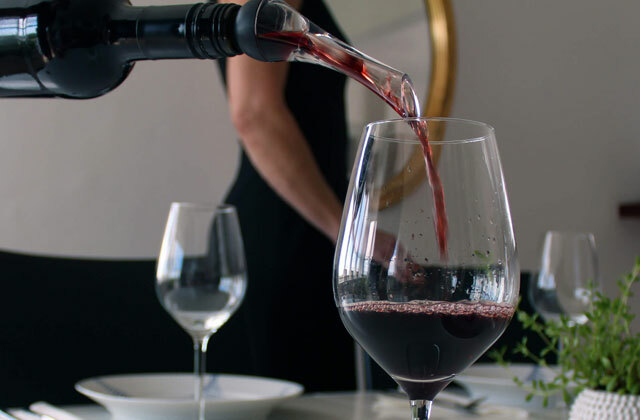 This complimentary accessory aligns with a chair seat in height and features somewhat tilted edges, allowing you to sit with your legs stretched to the full length. Not only is it convenient but also this position improves blood circulation in lower limbs and helps relax your muscles. The seat is very soft and welcoming and even the armrests are fully padded to make you lounge in maximum comfort. In addition, the seat of this armchair swivels 360° around its axis. So, when you sit you can easily turn in any direction without the need to stand up. This function is a great option for open spaces and larger living rooms with several sitting zones. Thus, reading a book near the fire, by a single movement, you can easily join your family members chatting on the couch. And rotation in no way compromises stability of the construction stability as it is supported by a large and sturdy round base. Designed in modern classics, the BeautLife armchair will add an exquisite touch to any contemporary interior and help you set up a functional lounge zone to have a comfortable rest whenever you want. 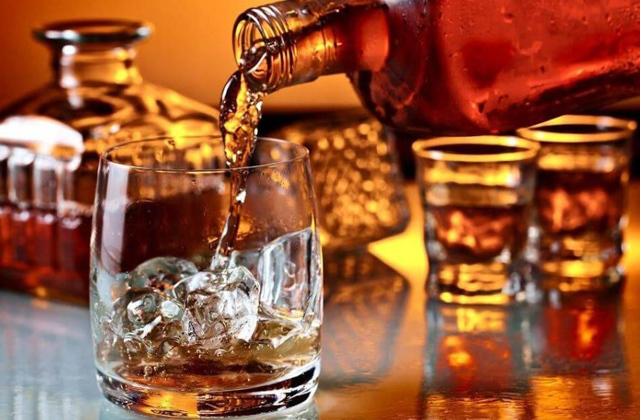 No need to say that table armchairs and bar stools differ in seat height and are meant for different types of use. 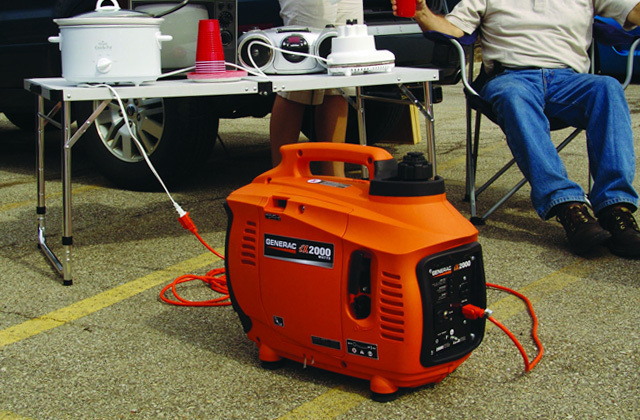 But imagine you can get the convenience of both in a single model that can be used in a variety of ways. And a rotating bar stool from WOLTO is up to it. The WOLTO is not an ordinary bar stool supported by four long legs and high to keep you rather half-standing than sitting. This piece of furniture is distinguished by the elegance and exquisiteness you’ll hardly find in pubs. 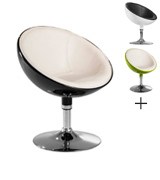 At a glance, its design reminds a wine glass with a sleek round base, slim waistline, and a convenient seat on the top. 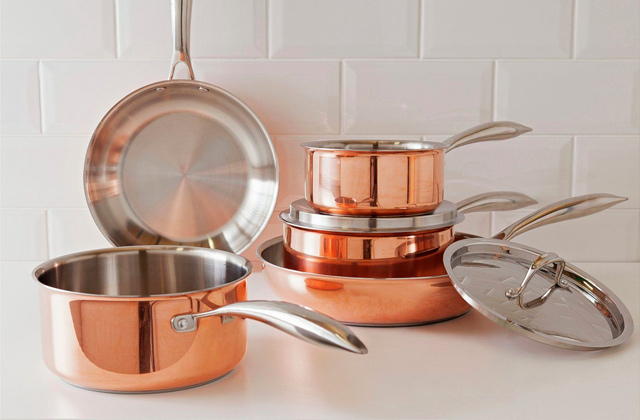 A refined design looks moderate yet very modern and stylish. The seat is made of faux leather that closely resembles genuine leather. 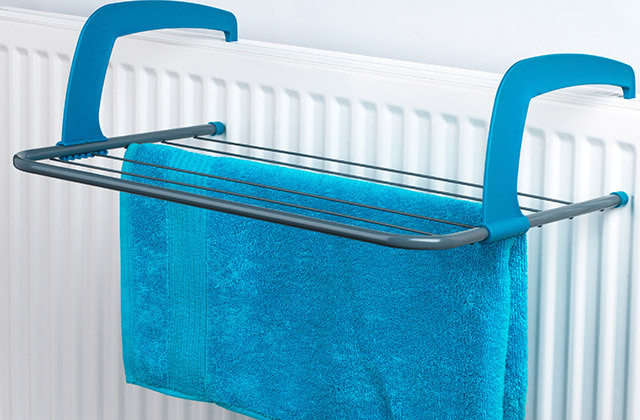 However, synthetic material is more durable, not prone to stains and stretches and is very easy to clean. Though not as high and roomy as seats in regular lounge armchairs, the seat of this model is fully padded and offers ample space for any type of sitter. One more distinctive feature that makes the WOLTO stand out from the crowd is adjustable seat height. Using a manual switch under the seat, you can set up the sitting height within the range from 44 to 57 cm. This way, the armchair can be used both as a high stool for a home bar, kitchen island, coffee shops, small cafes, barber shops or any other type of high counters in public places and as a common chair for a dining table or a dressing table in your bedroom. 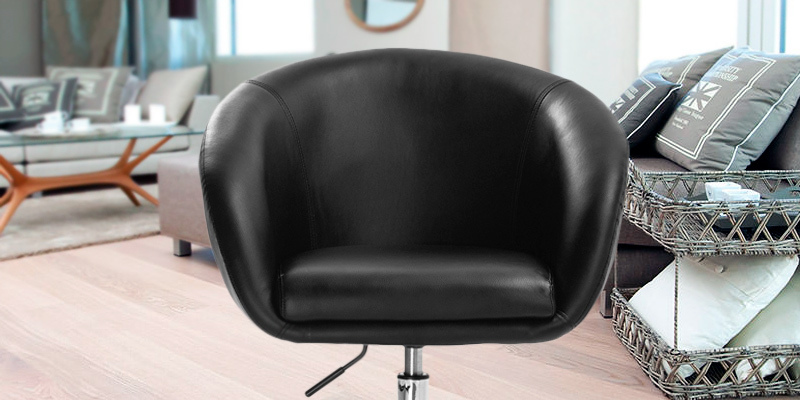 To conclude, adjustable, functional, convenient and stylish, the WOLTO faux leather swivel armchair is a great choice for home and commercial use alike. Some chairs rather are design objects that only add kind of special touch to the interior style and are not the best option to sit on, while others vice verse are initially created to provide maximum sitting comfort, though not distinguished by a funky design. 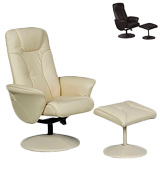 The rotating armchair from HOMCOM belongs to the latter. This model won't strike you with an extravagant style, yet, you'll be really amazed by the ultimate comfort it brings. You’ll get a roomy seat with a high reclining backrest that will easily accommodate users of any body build. Padded armrests will conveniently support your arms and elbows while sitting. The headrest is heavily stuffed with a soft yet resilient high-density 24D sponge. Perfectly keeping its shape, it will provide due support to your head and help release muscle strain in your neck. Besides, the chair comes complete with a footstool to let you conveniently stretch your legs when sitting. 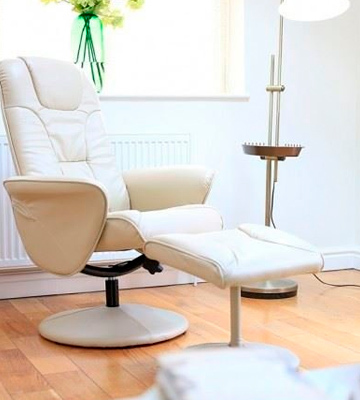 Overall, the armchair is so comfy that you can easily fall asleep in it. 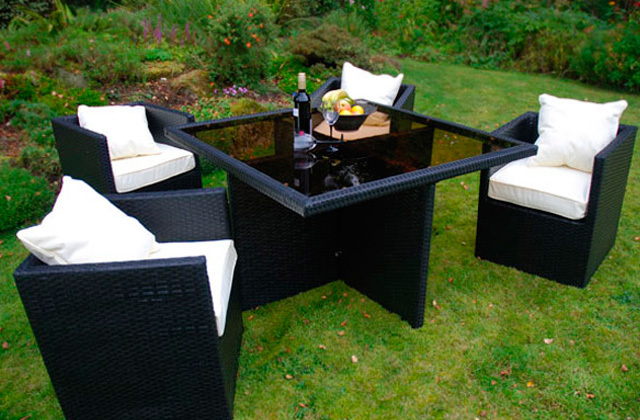 Comfort aside, this is a really durable piece of furniture designed for extensive daily use. 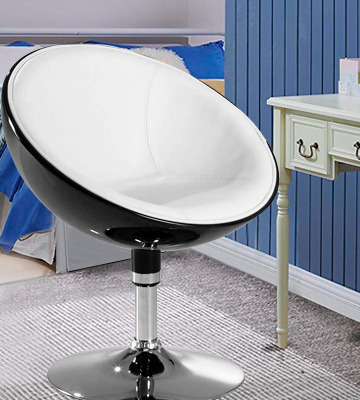 The seat features a sturdy steel frame and rests on a solid stand with a round base. The whole construction can handle an impressive weight of 130 kg and will stay stable on any surface. 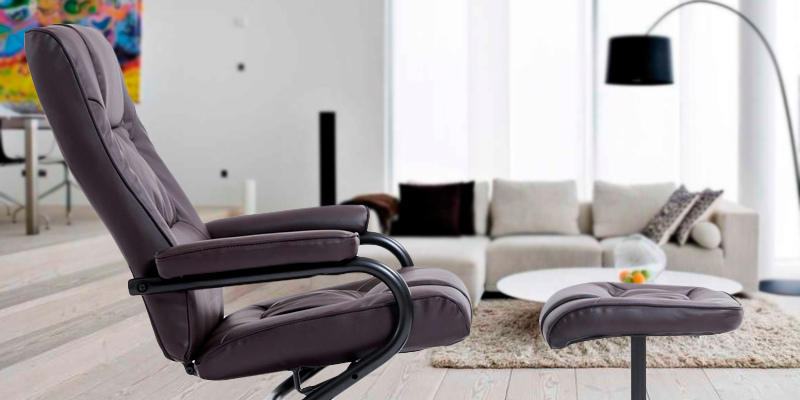 In short, if rest and relaxation are what you expect when sitting in an armchair, the HOMCOM swivel recliner will fit the bill. Despite being far from extraordinary, its classic lines and moderate design will seamlessly fit into any home or office interior. As the proverb says, everything old is new again. Many modern interior styles follow the design tendencies of the 60s and 70s with its fine lines and geometrical shapes. If you are one of those people who are into the style of that time and want a retro vibe for your home interior, you will definitely like the Duhome lounge chair. Inspired by a legendary ball chair of Eero Aarnio that became a central point in many interiors of the 70s and is still very popular with modern designers, the Duhome swivel armchair has a seat shaped as a semi-sphere. 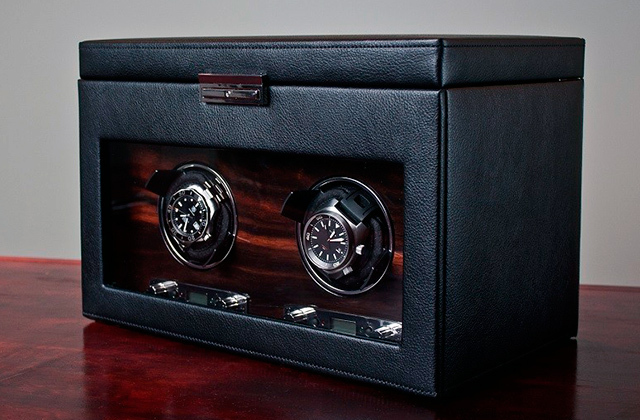 With an exterior made of glossy plastic and an interior lined with soft faux leather, this model somewhat reminds a jewelry box. From the inside, the seat is padded with a soft and dense material to create every comfort for long sitting. 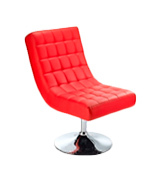 Offered in 4 bright and vivid color combinations, this piece of furniture will liven up an interior of a modern flat, studio bar, small cafe, night club, reception area in a beauty salon and more. The quirky retro style design still turns heads and is actually beyond time. It will ideally match into any loft, art deco, modernistic or futuristic interior. Though pretty compact in size, the Duhome is a fully functional armchair with a solid metal base and leg that can handle the weight up to 130 kg, which is comparable to the weight capacity of much larger models. 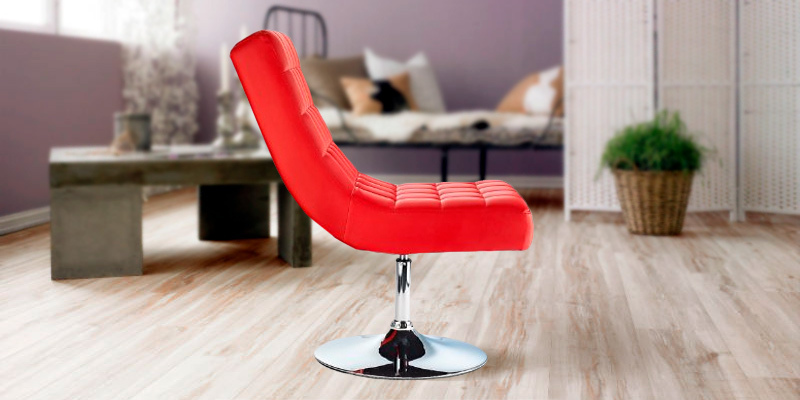 An anti-slip rubber ring on the base will keep the chair stable and prevent skidding on any floor surface, meanwhile, protecting the floors from scratches and damages. To put it in a nutshell, distinguished by a whimsical design and retro-style charm, the Duhome swivel armchair can serve not only as a comfortable seat but also as a piece of decor. Design details are those little things that give a zest to the interior style and make it special. That specific detail could be a gorgeous chandelier or a standing lamp, a fine Oriental rug, a picture on the wall, an old Chinese vase or even a piece of furniture like a bright swivel armchair from Constantino Montana. This model will catch your fancy from the first sight and there is really nothing to dislike about it. A round base with a slim leg made of mirror-sparkling stainless steel perfectly match with a matt surface of a faux leather seat in a fire-red color. The seat looks like a long puffy pillow stitched into uniform squares and slightly bend to hug your body with comfort and softness. Ergonomically designed, it provides ample space and keeps you sitting relaxed in a somewhat tilted position instead of a strictly upright posture. 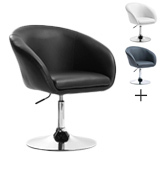 With that, the backrest is high enough to support your head. And you will like the swivel action giving you every freedom of movement when you sit. Looking very much like genuine leather, faux leather is much easier to clean, better withstands extensive daily use, and keeps its brand new appearance for longer. 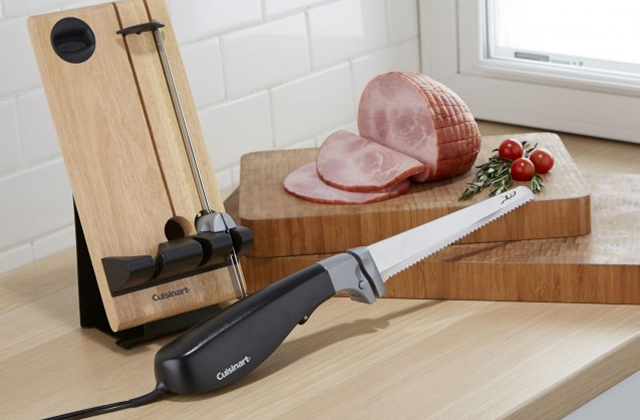 What’s more, adding value and beauty to the whole item, it doesn’t add to its price, so this model is offered at a truly affordable price tag. An appealing design and bold color pattern will make this model a focal point and a bright accent of any modern, minimalistic or monochromic interior. Adding chic to the design, the Constantino Montana smartly combines style and comfort and will become a functional complement to any lounge area. What Is a Swivel Armchair? A swivel armchair is a type of armchair with a seat resting on a single leg and rotating 360° both to the left and to the right. It is also called a spinny or a revolving armchair. Being a staple of modern style, the first swivel chair was invented by the American statesman and ex-president Thomas Jefferson back at the end of the 18th century. He put an English Windsor chair seat with a high back onto a spindle with castors to allow the chair to rotate and provide enough movement to the sitter. In general, modern swivel armchairs follow the prototype, yet, have advanced in many ways. They come in a whole variety of designs matching different styles and all sorts of applications. They range from slim and funky stools on a high leg with lower arm- and backrests ideal for bars, kitchens, balconies, dining rooms, and small cafes to comfy armchairs with generously sized seats, high soft backrests and even footstools suitable for living rooms, restrooms, lounge areas, bedrooms and dens to modern style chairs on wheels and featuring ergonomic supportive backs that will make you comfortable during work in the office. Hence, some models rest on sturdy fixed bases and are designed to turn only around their own axis that makes them perfect for large rooms and open spaces with a number of focal points such as a great view from French windows, a fireplace, and a communication spot to chat with your friends. 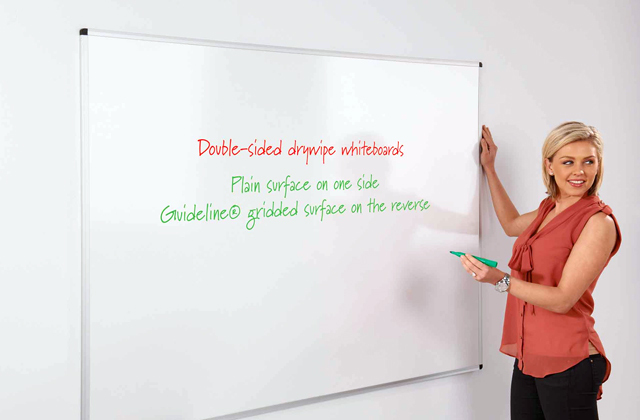 Meanwhile, others come with the wheels and along with swiveling, they offer easy movement around the room or between the tables, serving a great option for a workplace. All in all, a swivel armchair can make a stylish and, what’s more important, a functional addition to any home, office or public place interior. If you are into comfortable, convenient, and practical pieces of furniture, a good coffee table can make a perfect complement to your swivel armchair.